The only thing that's crazier than psycho killers are psycho killer stalkers. Psycho killers are scary, yes, but sometimes they just kill because the victim was at the wrong place at the wrong time. However, add in the stalker aspect, and there's an obsession that gets thrown into this deadly mix. 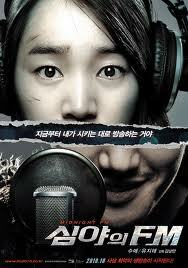 MIDNIGHT FM starts on the last night of broadcast for Ko Sun-Young (Soo Ae). She's a popular TV announcer and host of a late night radio show. After tonight, she will be traveling to the USA for a while because her daughter needs surgery to help fix her voice. However, during her broadcast, she gets a threatening messages and phone calls from her biggest fan, Han Dong-soo (Joon-Ha, from OLDBOY). He has an unhealthy obsession with Young and feels that she speaks to him. To ensure her broadcast goes the way he wants, he has broken into her apartment, and has her sister, daughter and niece hostage. Thus the cat and mouse games begin. Young's program is scheduled to last for four hours, and Soo has planned out every detail. If she misses a single step, he slowly tortures her family. Young is caught in a bind because some of his requests are insurmountable. Not only is he requesting certain songs from years and years ago, but he wants what she specifically said leading into the song. All of these requests tie into understanding our stalkers sick and twisted life purpose. Director Kim Sang-Man has crafted a very tense thriller. Once Young has made contact with Soo for the first time, the action is nonstop. All the parts are wonderfully acted, and a special recognition should go to the young actress who plays Young's daughter. Child actors, especially in thrillers, can completely make or break the flow of a movie. However, this young girl, who plays a character who cannot talk, is absolutely mesmerizing. Even with the scenes with Soo, my eye kept going her. To the same respect, Young, as her mother, portrays her character with pristine balance. On the one hand, she's a mother wanting to keep her family safe, so it would be easy for hysteria to set in knowing they're in danger. However, she has to come across calm and collected on air while fulfilling her stalker's request so the listening public doesn't suspect anything is wrong. Hard to manage, but Soo Ae does it with ease. The story itself isn't original; however, I still found myself engaged each step of the way. A weakness is having too many characters that seem to serve no purpose, including the show's producer, the producer's boss, another stalker-ish fan, and a gang of motorcyclists. The momentum is somewhat lost when the focus shifts away from our two leads. Another story element that would have made this much more enjoyable was if the action was happening in real time. All the action takes place over four hours, and the time frame feels a little disjointed at some points. If the filmmakers had made a concise two hour film that takes place in real time, the tension could have been heightened even more and the tone could have been even more frantic. Minor details though. In a way, this movie portrays the darker side that fame can bring. News stories have talked about stalkers for movie stars before, but this exploration brings a frightening aspect to that reality. Though the story itself is nothing to write home about, MIDNIGHT FM has some wonderful acting moments and is an effective cat and mouse thriller.